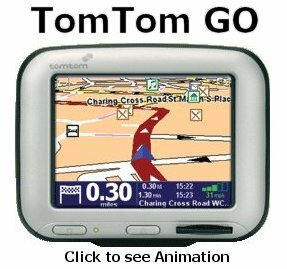 Note: The TomTom GO software has been updated click here for our review of TomTom GO Version 5. 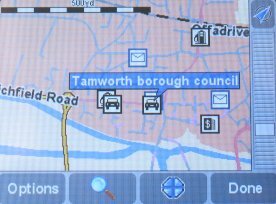 TomTom are very well known in the Pocket PC market, and have recently brought out a Palm version in 2004 and now their dedicated Satellite Navigation system for June. 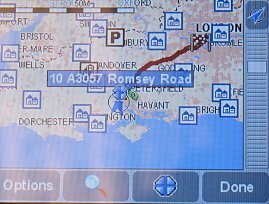 Although TomTom are usually leading the market they have been a bit late off the mark with Navman beating them to the post nearly a year ago with the iCN630, TomTom have now responded with their own portable in-car navigation system. TomTom have decided sensibly to base all of their products around a common navigation engine which is platform independent. 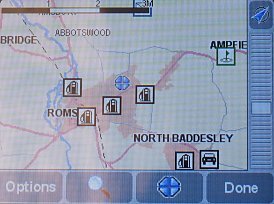 The TomTom Navigator for Palm was the first of these products to be released. Now the TomTom Go is about to hit the streets. 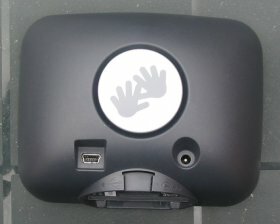 Go is a Pocket PC Platform which is running a version of the Linux operating system. The common navigation engine base makes it much more easier to issue software updates right across the product range in a single sweep rather than having to work hard at each separate product update. The Palm and GO are the first two products to use this new software architecture platform, and this will be followed by Navigator on the SmartPhone and Series 60 platforms, and finally the Pocket PC will follow at later date. 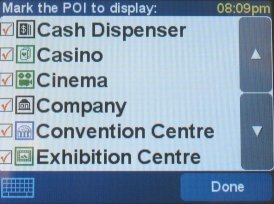 With that said, a lot of people openly discussed the downsides of the Palm OS version of Navigator because of the lack of customisable POI's, this is soon to change. The TomTom GO is to be launched in the UK soon and it is the intent of TomTom to ship customisable POI's. For those of us with the Palm version the customisable POIs will be a free upgrade (no date announced yet). 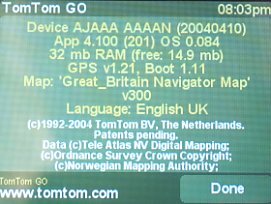 Mike and myself have been testing an early engineering sample of TomTom GO for a couple of months now, the beauty with GO and all dedicated systems that aren't PDA's is that it's dedicated, you cannot install other applications or games to it. 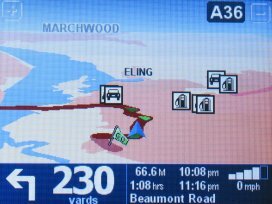 You might see this as a downside, but it really is a plus, because time after time we all find at Pocket GPS World that a navigation product has broken. We don't necessarily know why, but we then have to backtrack our steps to find out what config changes we have made, whether we have installed other applications or games that have interfered with the navigation product, or if it's just a navigation product patch that's gone wrong. This is where the GO, iCN630, Street Pilot and Road Mate's of this world do excel. Quite frankly it's been pure bliss for a couple of months being able to put GO in-car, power it on and it's got a fix, no worrying that I've done the power up sequence correct. 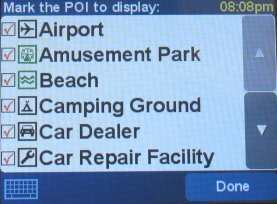 Due to me running a lot of systems in-car, I have to usually go through the process of turning on my mobile, waiting, powering up my bluetooth headset, then powering on my BT GPS's and then the Pocket PC's. If I do it in any other order, I can't get my Bluetooth headset to talk with my mobile. Likewise, app's can start hanging if they find a headset, or even if I select the wrong connection. TomTom have put a lot of thought into GO. Firstly they've gone with something they're happy with, trying to pull the three systems to a single product platform which will make life easier going forward. They've also used a Palm/Pocket PC style processor, RAM and screen, these work very well and prices are coming down on these components. TomTom have based the storage technology around SD cards, they are fairly stable and robust, and now go up to 1GB in size which is enough to house maps for Western Europe, or even the US so it makes sense. They have chosen the SD format because of the digital signatures of the memory cards. This means that the maps come pre-activated based on the security code of the SD card. TomTom have also tried to appeal to the gadget part of our natures by creating express-on style covers. Currently TomTom will ship with only silver, they will look at creating different colours later on in the year once they see GO selling well, and I'm sure it will sell well. GO is really small. It's still fairly weighty, but looks very similar to an Apple iMac with a domed back. 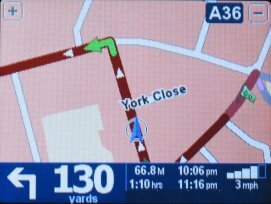 The screen is a little smaller than a Pocket PC screen, but is bright enough to use in sunlight (but not as bright as a Garmin Street Pilot). The audio is nothing short of fantastic. This thing sounds as loud as a hi-fi. You think I'm kidding ? Try it if you get a chance to see one in a store, the audio is fantastic and has a real load of bass to it. 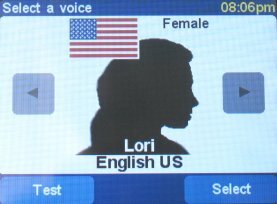 Two sample WAV songs were pre-loaded as voices on our test units, and whenever I play the audio samples, people are blown away! 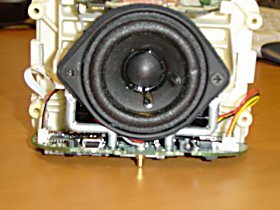 The Special 8 and Special 9 sounds were those sample songs that I mentioned earlier, and I hope these are included in the production models as it really goes to demonstrate how loud GO's speaker really is! 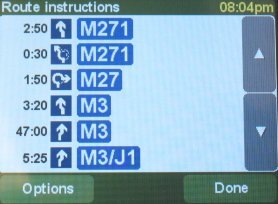 We first saw street names shown on the Palm version of the Safety Screen, and GO replicates this information. 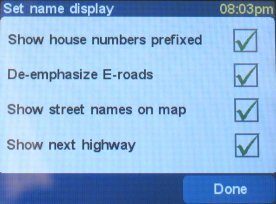 Like the Palm and Pocket PC versions you can also Show house numers prefixed, de-emphasize E-roads and also show next highway. 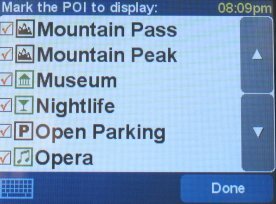 You can also specify what type of information you want displayed. 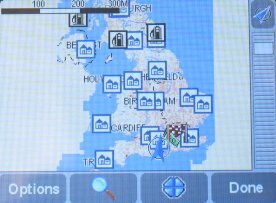 The map screen looks very similar to the Palm and Pocket PC version, but you do have an options button, menu button (magnifier), cursor position and done button. You can zoom in and out by moving the vertical slider on the right hand side of the screen up and down. 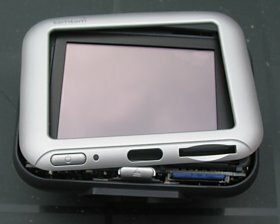 TomTom have always incorporated a Safety Screen into the Palm and Pocket PC versions of Navigator. When below the safety speed you will see the map, either in 2D or 3D depending on the view you have chosen. 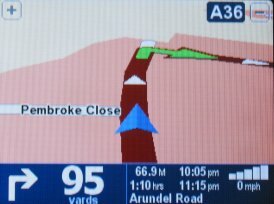 Above this you will see just the next turn instructions with a summary of your route in terms of distance and time. 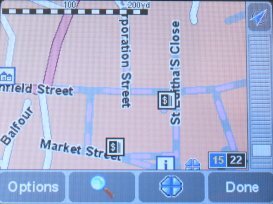 TomTom GO has the usual amount of POI's that you would expect to see from TeleAtlas and also in other TomTom products. 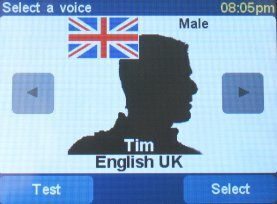 TomTom GO does not at currently support customisable POI's, but should by the time it is launched in the UK. The mounting bracket supplied with GO is a windscreen mount similar to that supplied with a Palm, it's suction cup is the same and also the arms that meet and can be angled and screwed tight are the same. GO sits into the interface slot on the base of the mount, the review samples Mike and I received were a little tough, TomTom say they have fixed this in production samples to make it easier to mount/un mount so it doesn't feel like you will break it (which it does with the review samples we received). GO just like a Palm or Pocket PC is always on, there's no boot-up sequence once you've powered it off using the power button on the front of the unit so it's in a saved memory state. When you power it on, within seconds the unit has powered up to the screen when you last powered it down, and within 50 seconds you're good to go on your trip. GO comes supplied with a non-coiled power cable which I found long enough for use in-car, but the beauty of GO is that it has it's own lithium-ion battery just like a Palm/Pocket PC which will last for up to 5 hours, so you can use it in-car without cable if you would prefer. Unfortunately I haven't been able to complete conclusive battery tests, but generally I haven't seen GO fall below 4 hours use on battery. 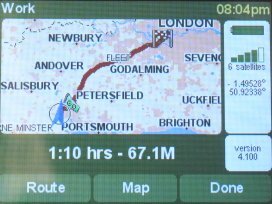 Mike used his TomTom GO with no battery power on a coach trip to Surrey and back once where the batteries lasted over 4.5 hours. The screen is a little bit of a let down on the review samples we received. 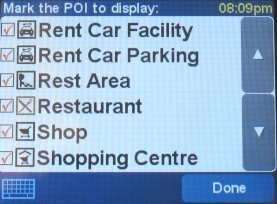 It's a glass style screen which means it doesn't have an anti-reflective coating on it, so when used in-car on a bright sunny day, you do see a lot of reflection from the screen. This is probably the worst part of GO, and the thing I hate the most. 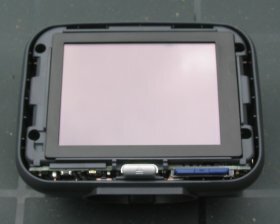 A non-reflective screen would be much better here, and I have suggested this to TomTom, I am hoping this may change on production models, but I think it's a little too late to change the screen. Failing that a custom made screen protector may help cut down on the reflectiveness of the screen. Mike did not suffer much from this so it may be very much dependant on your mounting and driving positions. To the right you will see a photo that I took at low light. The photo was taken at around 11pm in May without flash to try and highlight just how bright the TomTom GO screen can get. 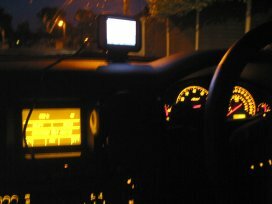 The photo shows the normal dashboard lighting in maximum mode The yellow screen on the left of the photo is my on-board computer which shows various information about the trip and fuel consumption. Above this in the center of the photo you can see the square TomTom GO screen. As you can see, the GO screen is pretty bright! If you are worried about brightness when driving at night there is a night mode which inverses colours and makes everything a lot dimmer. If this is still a problem then you can use the properties menu to turn down the overall brightness. 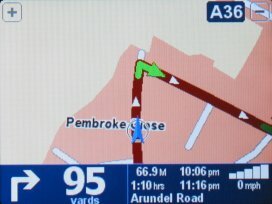 TomTom have added a new feature over the PDA versions as GO supports two horizontal plane sensors to detect movement. When enabled (and can be disabled), and you lose satellite signal, then it will use hardware sensors to detect your speed and direction of travel. This will be ideal for cities like Zurich or Basle where there are a lot of long underground tunnels with junctions in them. In theory this is a good move forward. I tried this on a number of occasions by jamming/blocking the GPS signal and if it did latch onto a couple of sats it could start shooting you across the country (not necessarily on roads) and at one point I was testing this with a re-rad antenna in my office blocking and unblocking the sat signals, I found myself traveling at 5000mph across the country. Now you wouldn't usually use this in-doors (at least I'd hope not), but there isn't any tunnels anywhere near me. The ASN was tested using the engineering samples and a few hardware modifications have been made along with a number of software fixes, so hopefully this will be fixed and working fully in production units. 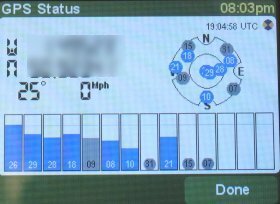 GO comes with the Safety Screen by default and you can change the speed at which this appears. By default with no speed set it will show the Safety Screen. When you tap this you will enter the menus where there are various icons available. 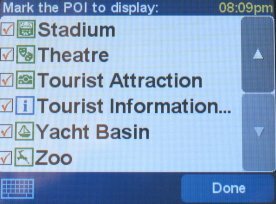 You can go to MAP mode and zoom in/out like you would on the Palm or Pocket PC versions, you can also go to an Route Instruction screen and Itinerary screen just to name a few. 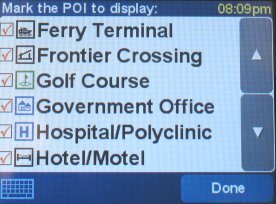 You also have the ability to set the screen to Night View or Day View like on the PDA versions and to enter into 2D or 3D maps for the Safety Screen. 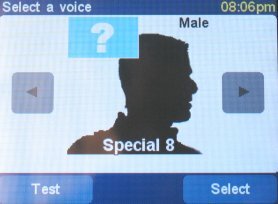 As this is essentially a PDA you also need the ability to set the date/time, and TomTom have given you the option to do so. You can also change map colours and brightness of the screen from the menus and change the Language and Keyboard sizes. 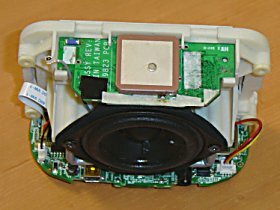 As you can see from the photo's that Mike took below whilst at TomTom's offices in the Netherlands, the speaker on the TomTom GO is really quite large, and faces the back of the GO unit towards where the silver circle is on the back of the case. At the top you'll see a square, this is the patch antenna and below that the GPS Engine Board that's bringing the satellite signal into the GO unit. Unfortunately a downside of GO is that it doesn't have a user serviceable/replaceable Li-Ion battery, so you won't be able to change this yourself, but should be good for approx 200-400 charges if not more. Most BT GPS's are still going strong and haven't had any battery issues so we wouldn't think there's any reason to think that the GO battery will die within a year, Dave still has a Socket BT GPS which is 16 months old and is still going strong. 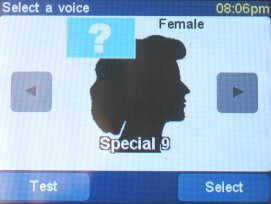 As I said earlier, the main disappointment for me was the screen. Having a very reflective screen in-car isn't good, and it seemed more reflective than a Pocket PC when out in bright sunlight. The other disappointment was the ASN, this didn't work as I expected it to, it doesn't have a gyro and it seemed to be doing more of a check on lat/long changing and if it came over a specific difference in what it would expect as entering a tunnel, then ASN would be activated. Obviously my desk wasn't moving, so that goes someway to suggest it's an internal software feature rather than a hardware feature or that ASN wasn't working properly. The Reset hole is hard to find, you need to first remove it from the mount, turn it upside down, and within the mounting base area of GO you will see two interface slots (currently only one is being used) and towards the front of the unit on the base you will see a little hole marked reset. This is just like soft resetting a Palm or Pocket PC, it requires something small like a paperclip, and nothing was supplied with GO to enable you to easily reset the device. 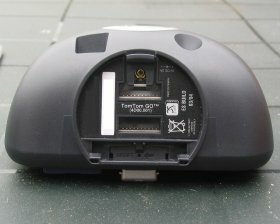 TomTom have made a push button on the base mount area of GO towards the back of the unit. If you push this button on the domed area forward towards the front of the unit then you will push the bottom part of the cover off slightly. If you then grab this with a finger/nail and pull gently, each corner should in turn snap off and you will be left with the internal state of GO without a cover. Personally I don't like the ideal of covers, I've never been a big fan when it comes to Nokia style Express-on cover's. The cover isn't exactly easy to take off and if someone uses a little bit of brute force, they'll snap the cover or damage the unit, so my personal opinion is I don't think this should be user serviceable. From the photos above you will see that GO sports a mini USB plug for connectivity to a PC, and also a DC jack socket. In the last photo you will see the two GO interface slots on the base. 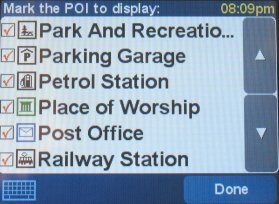 Mike and myself have received and updated the ROM's on a number of occasions with ease. We had to do this by downloading the new ROM software to a blank SD card, soft resetting GO and inserting the SD card with the ROM files on to update it. 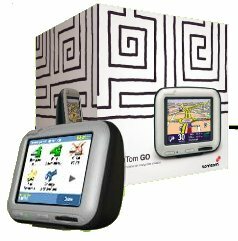 This has changed for the release version of TomTom GO as the unit has a Mini USB socket and will be capable of downloading a new version of the software and updating from your PC connection. TomTom are selling GO direct from their website at the advertised price of 799 Euros which works out roughly at the current Euro to Sterling conversion rate to £530. However TomTom have set the UK SRP to £499 but expect to see it drop a little lower than this at some retailers. This makes GO a lot cheaper than a Navman iCN630, the Garmin Street Pilot 2610/2620 and Magellan RoadMate (although these all do come with European maps in the box where TomTom GO comes with a single country set+Major Roads of Europe on CD). One further thing to point out is these all do have touch screens apart from the Navman iCN630 which does not. TomTom Go is a great product, I have liked the Navman iCN630 V2, especially with the 3D style maps, but TomTom has several features above the iCN630 V2 here, namely a smaller compact unit, an internal battery and an extremely good audio setup, and the price is considerably lower. GO is really aimed at the newbie that doesn't want to have to buy a PDA or mounting bracket, but likewise anyone already having a PDA and SatNav and becoming increasingly frustrated with having compatibility issues or frequently having to soft reset the PDA, will love GO.